Matthew Jay's 2001 debut album Draw was not only an impressive introduction to the late singer/songwriter, but comparisons to Elliott Smith, Badly Drawn Boy, Nick Drake, and Beth Orton carved him a well deserved space in new millennium troubadour rock. Widely received critically, GQ went on to call it "one of the most impressive debuts of recent times." The record mixed folk-pop compositions with modern electronic instrumentation and was destined to have an impact on the record buying public. Draw found a home on college radio but unfortunately, failed to find substantial success in the states. At the time of this writing, the effort has only scanned 7,858 units in North America according to Soundscan, an inexcusable calamity itself. For those that were fortunate enough to take a chance on the album, they quickly found a melodic and heartwarming addition to their record collections that deserved repeated spins. Draw was a record of huge proportions that proved that sales do not necessarily represent success. Unfortunately, the days of artist development are a thing in the past and Jay was released from his recording contract. After the debut's campaign and being dropped, Jay bounced back and went on to write and begin recording what was to be the follow-up. However, on September 24, 2003, just a month before Elliott Smith's death, Jay tragically fell seven stories from a friend's apartment window in London. He was only 24 years old. After fans publicly posted messages of adoration and sadness for his loss at his website, the surviving members of his family realized that even though Jay was no longer physically with us, his music must live on. They quickly conceived a plan to release his long out of print, rare early singles and EPs on one compiled disc. The collection was appropriately titled ...Too Soon, and was offered for purchase at his website. Proceeds from the sale would assist the massive financial costs of completing Jay's works in progress for his sophomore record (according to www.crookedsmile.com, the official site for Matthew Jay, the music he was recording will be available in September 2005). For those that were not familiar with Jay's progression as a songwriter, or those that simply were not fortunate enough to purchase the early releases, ...Too Soon is a wonderful companion piece and stepping stone to the beauty of Draw. But the music found on ...Too Soon (or Draw for that matter) isn't what you'd expect from a singer/songwriter highly touted as the next Elliott Smith or Nick Drake (both highly known for their penchant for melancholia). The music sounds more like a celebration of life and the hope that comes after surviving dark times. That is precisely what Matthew Jay's music offered its listener... not escapism from the personal challenges we find ourselves in, but an honest embracement of the slivers of joy that come our way after a period of difficulty. The good times are just as important as the bad because we are getting stronger throughout both, and the two are represented in his songs. It's a celebration of love, of heartbreak, and experience. It is the sound of inspiration. It's a tragedy that Matthew isn't around to share his art with us anymore. He is and will continue to be greatly missed, however a line included in the song "I Hope She's Alright" says it best: "If I'm in your thoughts... I'm where I wanna be." Some stars truly do fade too soon from view. 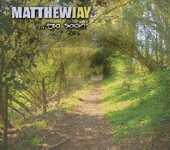 To listen to tracks and purchase Too Soon please visit www.matthewjay.com. For additional news, biographical information and other tidbits, please visit the official Matthew Jay website's at www.crookedsmile.com. Suggested Track: "You're Not Here"